Fabrisoinc has been 3D printing aluminum and copper heat exchangers for years. Because UAM is a hybrid process, all of the flow paths printed into our parts are CNC milled allowing for high accuracy and great surface finish. Recently we finished up a large program for NASA that sought to improve the state of the art with embedded channels. In our last post, we talked about using custom cut insert panels to span large unsupported areas. One problem with that method is that it inherently leaves an unbonded zone where the edge of the plate meets the edge of the step machined in the part (as seen below). Another technique that we recently investigated, was using Friction Stir Welding to seal this vertical ‘crack’. Since our SonicLayer machines are of a hybrid design, we already have a high strength spindle in the machine. To FSW the plate outline, and thus seal the ‘crack’, we simply need to do a tool change and raster the pin tool along the path. 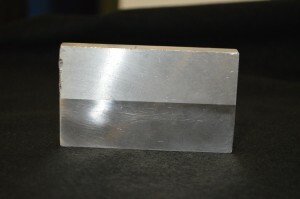 The picture below shows a square insert that has been friction stir welded. After welding, the CNC mill comes in to machine the area flat and we continue to weld material. 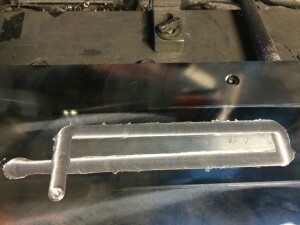 This technique will allow UAM to build large unsupported regions and have a final part that is 100% and welded with solid state welding processes. In our last post, we described how the primary concern when using UAM to build heat exchangers is unsupported material. The UAM process uses several thousand Newtons of force in order to create a bond. For structures such as channel ceilings, no normal force exists to push back and enable bonding. 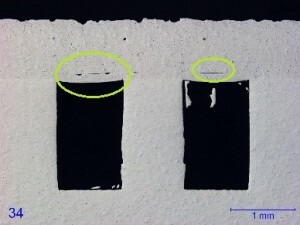 Directly above the cavity the lack of support can cause welding discontinuities. We have recently been experimenting with many techniques to reduce or eliminate the welding discontinuities over channels. One method that has merit for large unsupported geometry is the use of an insert panel. Intuitively the main driver of discontinuities in unsupported regions is the fact that a single UAM layer (.006”-.010”) does not have sufficient strength to support full UAM loads without deforming. How can we modify the ceiling so that it does have sufficient load carrying capacity? One possible answer is a custom fit insert. The custom insert could be designed such that it can support the applied load with minimal deflection. This method inherently leaves an unbonded zone, as UAM cannot weld thick components. 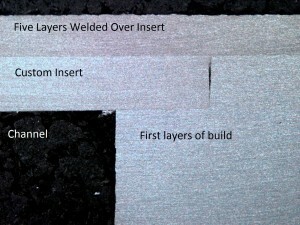 However, layers directly above the insert weld with one hundred percent density. Although this method is not great for highly complex winding channels, it works great for large unsupported areas. 3D printing allows for a level of creativity and innovation that is unmatched by traditional manufacturing. Low temperature joining, complex 3D flow paths, weldable metal matrix composites—these are just a few of the unique capabilities made possible by ultrasonic additive manufacturing (UAM), a revolutionary 3D printing process. 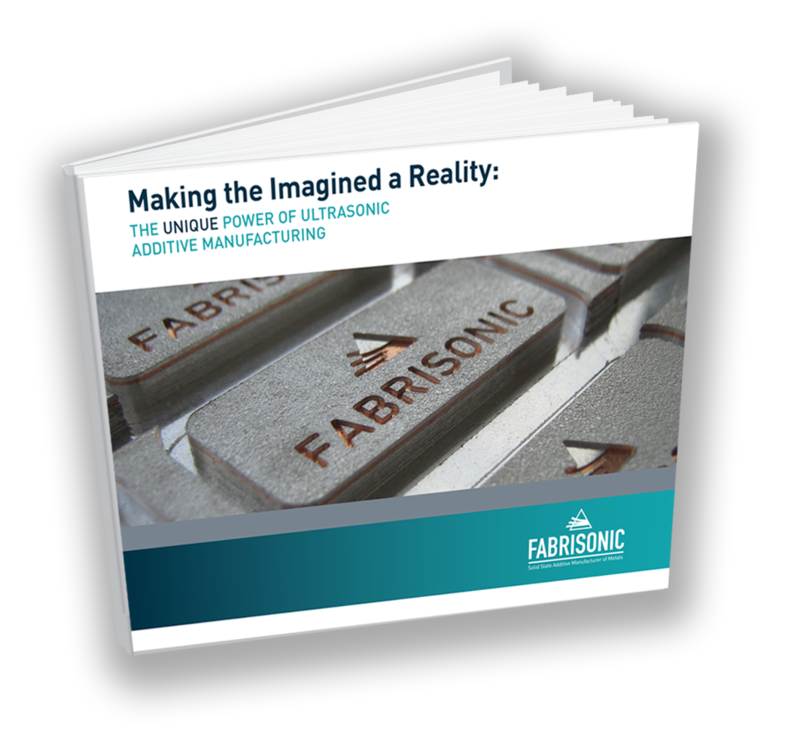 Our new guide, Making the Imagined a Reality: The Unique Power of Ultrasonic Additive Manufacturing, explores how ultrasonic additive manufacturing empowers manufacturers to create structures that are impossible using other manufacturing techniques. The guide also features several examples of innovative applications only made possible by the patented UAM technology. The primary concern when using UAM to build heat exchangers is unsupported material. The UAM process uses several thousand Newtons of force in order to create a bond. For structures such as channel ceilings, no normal force exists to push back and enable bonding. 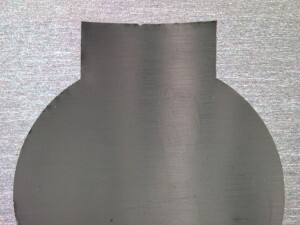 Directly above the cavity the lack of support can cause welding discontinuities (as seen below). Although hermetecity and burst pressure tests have shown that the resulting structure can far exceed possible mission requirements, the discontinuities are a concern simply because they exist. Prior work with embedded channels, has mostly focused on using straight ball nose end mills to machine channels. While this uses standard off the shelf tooling, the resulting cross section is at its maximum width at the top of the channel thereby maximizing the crucial unsupported region. Custom end mills are available on the open market that could be used to create sufficient cross section while shrinking the unsupported width. 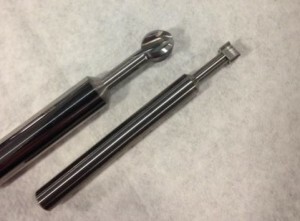 Under the NASA contract, Fabrisonic developed techniques for using so-called ‘undercut’ endmills for creating channels. The resulting channels had 50% less unsupported area per the same unit volume. These new channels were able to be sealed with completely clean cross sections. This will allow higher quality UAM builds for thermal management devices. The solid-state nature (i.e. no melting) of ultrasonic bonding permits joining of dissimilar metals without the formation of brittle intermetallics seen in fusion processes. A wide range of material combinations have been successfully bonded using the technology while still maintaining their own individual metallic properties; such as, Al/Cu, Al/Fe and Al/Ti are routinely joined. Fabrisonic has also worked with exotic combinations such as Ta/Fe, Ag/Au and Ni/Stainless. In theory, with enough ultrasonic power, the process should be able to bond any dissimilar metals. One great application for welding dissimilar metals is production of transition joints. In many industries, there is often a need to transition from metal A to metal B. For instance, in liquefied natural gas systems, part of the system is made from aluminum and other parts from stainless. Welding aluminum to stainless is very difficult with fusion based 3D metal printing because it creates intermetallic compounds that are highly brittle. Solid-state welding is the best approach to making these types of joints. Fabrisonic can 3D print custom transition joints from many dissimilar metal combinations. The picture below is a two inch thick slab of metal. The first inch is 304 stainless to which another inch of 5052 aluminum has been printed one layer at a time.